Burden's Vacuum stocks and displays all the Miele canister vacuum cleaners. We guarantee our pricing on all Miele products. Plus, when you buy from Burden's, you get our FREE and famous service and repair benefits that you don't get when you purchase Miele elsewhere. Burden's Vacuum is also your local Factory Authorized Miele service and repair facility. Let's talk Miele. Let's talk vacuums. It's what we've been doing since 1961. The Miele Complete C3 SoftCarpet Canister Vacuum is one of the first units designed specifically for gently cleaning delicate ultra soft carpeting. A specially designed soft carpet power setting and vacuum head makes it a must-have for protecting your flooring investment. Built with the same versatile engineering you’ve come to expect from a Miele product, it features a variety of tools for not only cleaning carpet, but also bare floors, and even hard-to-reach areas. A deluxe handle grip with electric controls makes operating this vacuum easy. An emerging trend in flooring is the installation of ultra soft carpeting. Extremely soft and fluffy, this carpeting provides increased comfort. It’s usually thick and extremely high-pile, so you’ll need a product that’s easy to push through the carpeting, has a high vacuum head height, specially designed suction levels, and gentle brushes. That’s where the Miele C3 SoftCarpet comes in. SoftCarpet Power Setting: Soft carpets tend to be very thick, that’s why the SoftCarpet power setting uses the 1200-watt motor to powerfully yet gently clean even the thickest flooring. SoftCarpet Electrobrush: Designed with a 14-inch wide cleaning path, its 5 levels of manual height adjustment, motorized brushroll, and swiveling neck makes cleaning any carpet height a breeze. The Miele SoftCarpet doesn’t stop at just cleaning thick carpeting. Several included tools make cleaning the whole home simple. When cleaning smaller hard flooring areas like in the kitchen simply attach the Parquet Twister Floor Tool. It’ll use soft bristles to gently clean delicate surfaces. The deluxe hand grip is outfitted with Electrobrush Controls so you can easily adjust the 7 different suction level settings. Cleaning more than just floors, several attachments including a dusting brush, upholstery tool, and crevice nozzle can be attached to the telescopic stainless steel wand for above and below cleaning. Built with a 12-stage AirClean Sealed System it’s nearly impossible for allergens to escape the vacuum’s chambers. A sealant around the casing directs air though the filtration system so vacuum air can’t leak out. An included HEPA AirClean Filter not only contains a charcoal film for neutralizing odors, but has been tested to capture 99.97% of particles as small as 0.3 microns. Using Miele’s patented Type GN AirClean vacuum bags, it features 9 electrostatically-charged layers and a self-locking collar for holding up to 4.76 quarts of dry debris. Long Warranty: Features a long, 7-year warranty on the vacuum motor. Quiet Operation: With its powerful insulation, that 1,200-watt Vortex Motor is virtually silent. Lightweight Construction: Its 11-pound skeleton design makes it easy to carry from room to room or upstairs. Cord Storage: The approximately 25-foot power cord features one touch cord rewind for quick storage. Large Cleaning Radius: Clean an area of up to 36-feet with the long power cord combine with the hose and telescopic wand. Bag Change Indicator: When it’s time to replace the vacuum bag and indicator light will illuminate. Castor Wheels: Durable castor wheels provide for easy rolling across nearly any flooring. Automatic Standby: When you need a break but don’t want to turn the vacuum off, simply slide the wand into a parking receiver on the base to activate standby mode. Practical Locking System: The floorhead, telescopic suction wand, and handle all lock into each other so noting comes loose. 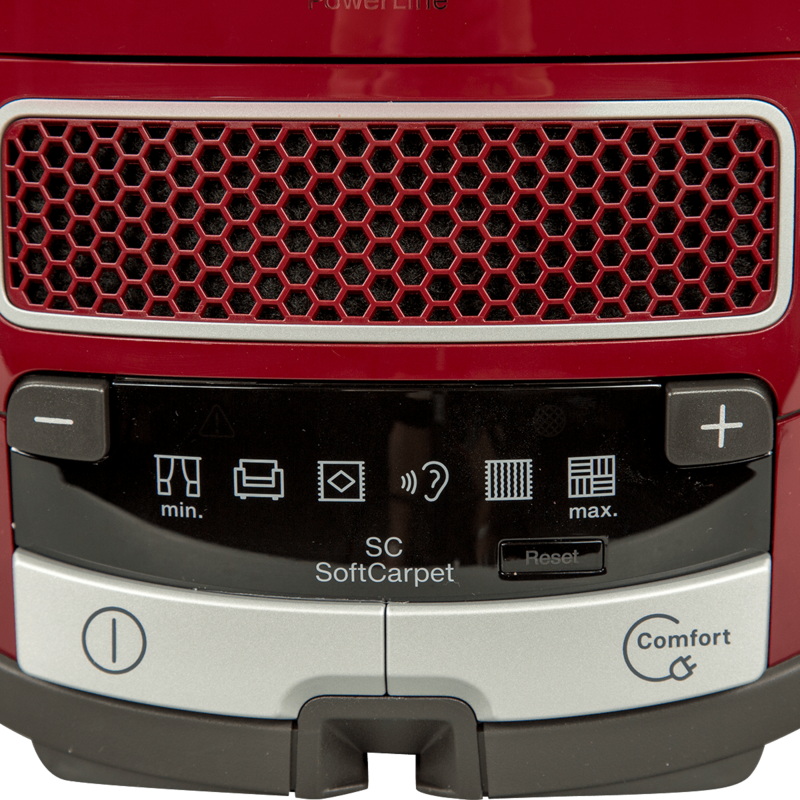 Specially designed to clean ultra-soft carpeting, the Miele SoftCarpet is easy to use and improves keeps your indoor air clean. Built for Soft Carpets: The 14-inch wide SoftCarpet Electrobrush combined with a SoftCarpet Power Setting to gently clean delicate carpets. Sealed Filtration: Over 99.97% of particles as small as 0.3 microns are captured and remain sealed inside the 12-Stage AirClean Filtration System.